This is a broadleaf evergreen, large shrub or small tree to about 8-12 tall and 6-8 ft wide. The branches are twisted with dark mahogany bark and leaves that are simple, alternate, leathery, elliptic to ovate in shape and a glossy gray-green. 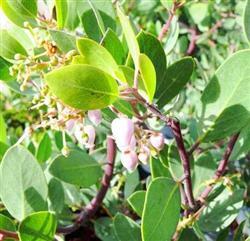 This Manzanita flowers pale pink, bell-like, in small branched clusters that changes to fruit somewhat tan-orange. This was a chance hybrid found in the demonstration garden of Native Sons Nursery, Arroyo Grande, Calif. It is believed to have resulted from a cross of A. manzanita ‘Dr. Hurd’ [white flowered} with A. densiflora ‘Sentinel’ [pink flowered]. It was named in memory of Austin Griffiths, who, according to the those at Native Sons Nursery, “guided us in our early years and opened our imaginations to the wonders of horticulture. it is a beloved and reliable garden favorite. I have planted this plant a year ago... and have to say that this is one of the slower growing plants! Had I known, I'd have gone with at least a 5 gallon plant. However, the leaves are very pretty.